When looking for audio for FCPX, you may find it useful to know that it is possible to create your own musical compositions from scratch. FCP Audio enables you to design and create the exact vibe and sound to suit your projects vision. For those less tech-savvy users out there, creating audio can sound like an impossible task – but there is another way. Luckily, our team here at FCP Audio have created lots of tutorials for you to watch so you have guidance every step of the way and you can confidently build a track that works for you. There are lots of advantages to being able to customise your chosen audio. Other websites pose problems in that the tracks they provide are set to one specific length; if this length does not work for your project then you are back to the drawing board. With FCP Audio, our ‘SoundStack’ service allows users to build a track from scratch within the Final Cut Pro X timeline, meaning it can be any length and will gel perfectly with the visuals you may already have in place. Firstly, within the extensive FCPX audio music library, all of the elements of every song are separated. This is why we call it ‘SoundStacking’. This enables you to quickly build the track to suit your video. For example, if you wish to start your video with a gentle piano track and then build up into a crescendo of multiple orchestral instruments, no problem. You simply ‘stack’ one sound onto another along the way, building and creating something unique as you go. You can then make the track as short or as long as you like. For a flexible and bespoke approach to audio production, make FCP Audio your go-to provider. Take advantage of our unique sale offer! To see all of our ‘SoundStacks’ in action, simply click here. All of which are completely Royalty Free and uniquely composed by our in-house team of music professionals. There are also no external programmes required when using FCPX, everything you need is there for you once you have downloaded, so you can start customising and editing your own unique music straight away! Audio for FCPX has never been easier to use and the best part about it is we do not compromise on quality and professionalism. Our dedicated team work tirelessly to make sure we stay ahead of the game. New tracks are always being added to the library. For high-quality audio that will enhance and compliment your visual projects. Look no further than FCP Audio. If you want more information about our services, do not hesitate to get in touch or you can check out some of the amazing samples and tutorials on our website. 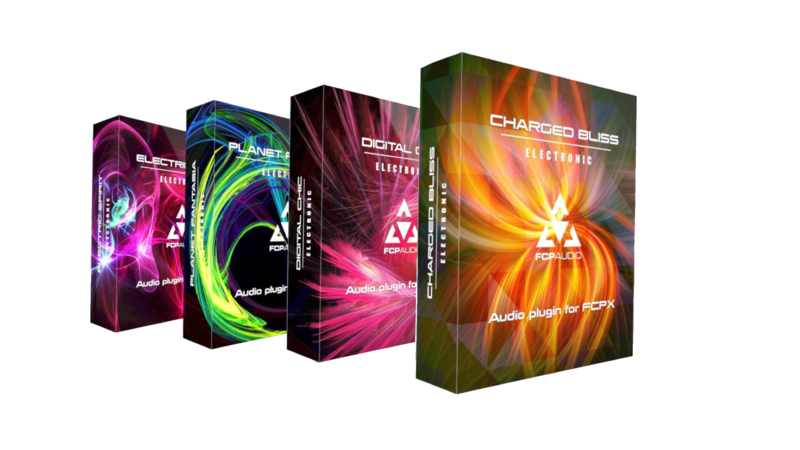 FCP Audio – Audio that works for you.